Colleen Bertsch is a Minneapolis-based freelance violinist who specializes in central and eastern European folk music. She plays violin for the Balkan party band Orkestar Bez Ime (OBI), Ukrainian Village Band, and the Madison-based Transylvanian string band, Szászka. Colleen often collaborates with Ethnic Dance Theatre as a performer and music director, and has also performed with Joe Chvala and the Flying Foot Forum (Heaven; Alice in Wonderland) and Minnesota History Theater (Baby Case; Sweet Land the Musical). As a member of OBI, Colleen was awarded a 2011 McKnight Fellowship for Performing Musicians, and a 2012 Minnesota Emerging Composers Award from the American Composers Forum. She is a three-time recipient of the Minnesota State Arts Board’s Artists Initiative grant, all of which have supported projects relating to folk music found in Romania. Colleen is currently pursuing a Ph.D. in musicology and ethnomusicology at the University of Minnesota. Her dissertation research, which focuses on the correspondence of musical techniques and identity among Transylvanian folk violinists, was supported by a 2015-16 Fulbright U.S. Research Award to Romania and a Doctoral Dissertation Fellowship from UMN. 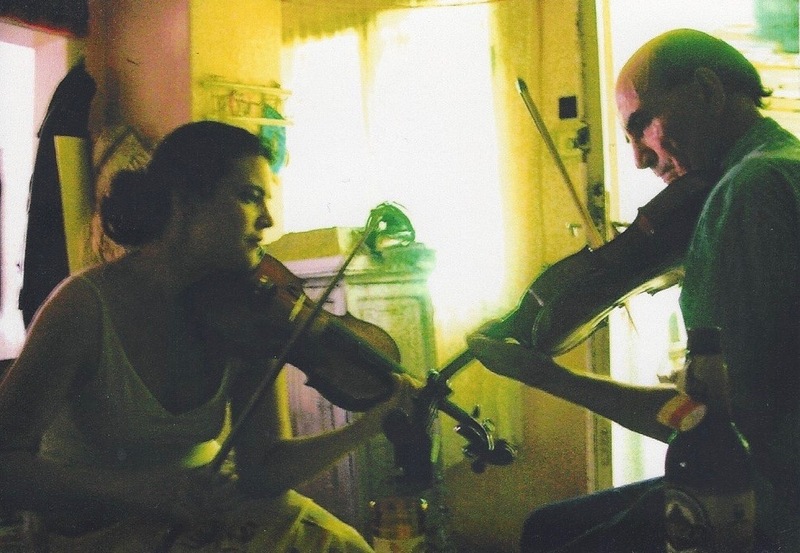 Her fieldwork requires playing with and interviewing Hungarian, Romanian, and Roma (gypsy) violinists living in and around the city of Cluj-Napoca. Colleen and Elek Horváth in Voivodeni, Romania, 2008. Chose items in the drop-down menu to learn more about Colleen and her musical activities.